Goodman is a rejuvenated brand that has dramatically increased the quality of their products in recent years while offering perhaps the best warranty in the business, demonstrating their confidence in their revamped product lineup. Models like the Goodman DSXC18 Central Air Conditioner also offer outstanding efficiency at a very competitive price. Here are more of the details in this HVAC prices submission from Derrick in Winnsboro, South Carolina. He shares his Goodman 18 SEER R-410A Refrigerant – DSXC18 central air conditioner price and his reasons for choosing a Goodman. 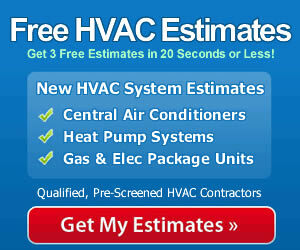 “I recently decided on the new central air conditioner to add to our system this year. I researched brands and central air conditioner prices for weeks and narrowed my choice to Carrier and Goodman. Carrier has the brand recognition and a very good reputation – with higher prices to go with them. Goodman has price on its side as well as a very good warranty. But I want a very good air conditioner that outlasts its warranty so had to dig deeper into Goodman’s quality. What I found gave me the confidence to go with the Goodman DSXC18 central air conditioner. It’s highly rated by contractors and homeowners for reliability and energy cost savings, essential qualities here in the sweltering, humid days of summer (and sometimes spring and early fall, too!). 18.0 SEER possible – That’s Energy Star rated. Limited lifetime warranty on the compressor including a Limited 10-year complete unit replacement if the compressor fails. 10-year parts warranty on everything else. Uses R-410A refrigerant that does not contain chlorine – won’t harm the environment. Compatible with ComfortNet Communications System that coordinates HVAC components for performance. 2-stage UltraTech compressor made by Copeland. Compressor sound blanket and other design and build details like the sound-control top limit noise. High pressure and low pressure switches protect the compressor. Coil and ambient temperature sensors ensure more balanced cooling without fluctuations. Filter dryer produces more efficient operation and greater longevity. Cost: Goodman DSXC18 central air conditioner and coil, $2,789. The keys to getting the maximum efficiency from your unit include more than just the quality of the air conditioner, as important as that is. It is also essential that a qualified contractor install, set up and test the unit to assure it is running properly. The installation of the equipment is just as important as what’s being installed. Use a pro with good experience and you’ll get the energy efficiency and the energy savings you paid for.